Candy Cane CHRISTmas Tree Farm was started by Frank & Catherine Genovese in 1977 and grew as their children, Nicholas and Michael grew. Frank, an avid organic gardener, applied many of the same earth-friendly principles to the farm that he used in his garden. After many trials and field improvements, they have developed the farm into a peaceful sanctuary where they grow many varieties of beautiful evergreens. In 1998, they transformed the field by being the first choose and cut farm in Michigan to install drip irrigation. This allows them to grow more varieties with better quality, greater health and needle retention. In 2007, Candy Cane CHRISTmas tree farm was honored to receive FarmBureau's top award for ecological farm management. One of the greatest pleasures the Genoveses derive from growing Christmas trees is seeing the joy of the families who come out to cut their tree. We wanted something festive, but something people could remember. We picked Candy Cane because the "J" candy was originally designed to represent the shepherd's crook. As biblical history tells us, the shepherds were the first to come and worship the baby Jesus. As children, both Frank and Cathy grew up with the manger scene at the base of the Christmas tree. The little manger scene, probably of dime store origins, became magical as we laid on our bellies as young children, contemplating the birth of Jesus in a stable because there was no room in the inn. There were the shepherd figurines lined up by the manger to visit the infant Jesus. In their hands were the crooks they used in the field to rein in the occasional renegade lamb. Thus, in the past century, this special candy shaped like a crook has come to be associated with Christmas. We are aware that the use of the evergreen in seasonal festivities predates Christianity. 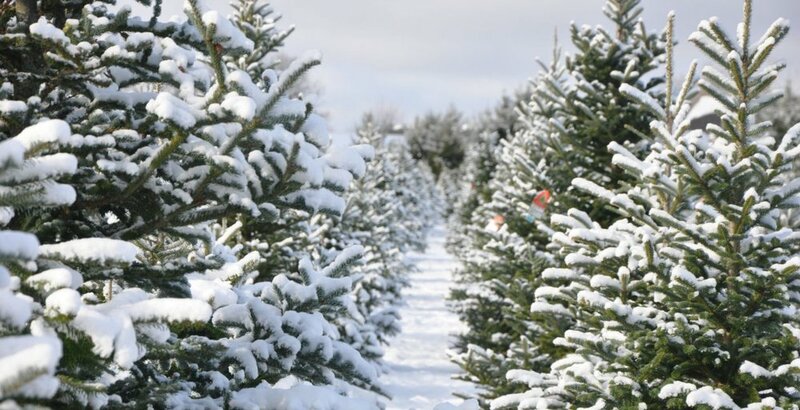 Since the 1500's, however, the evergreen has become associated with the Christmas season. Today, we are delighted that many of our customers who hail from from a variety of cultures and religions choose to share our rich tradition of putting up a Christmas tree and sharing the love, peace and joy it brings us. --Gleaners Community Food Bank of Southeastern Michigan which provides over 40 million meals to the hungry of the five county area of southeastern Michigan, each year through over 500 area pantries and soup kitchens. --The Christmas Spirit Foundation which sponsors the Trees for Troops program and other charitable endeavors. We invite you to join us in supporting these organizations, if you are so inclined and able, by dropping a few dollars into the contribution can on the counter.